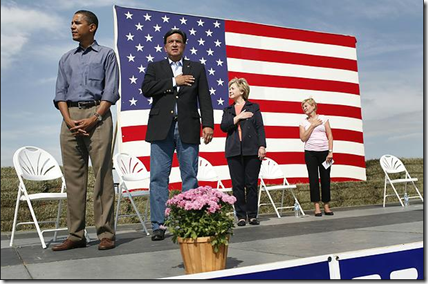 Upon becoming a national figure in the mid 2000s BO made some early mistakes in his execution of Saul Alinsky's Rules For Radicals as the doctrine pertained to seeking the presidency; namely, BO was questioned about not placing his hand over his heart during the playing of the Star Spangled Banner & he got into a controversy about not wearing an American flag lapel pin on his jacket. These petty things made some of us take notice – an Alinsky no-no in which the goal of the doctrine is to keep focused on transferring wealth from the "haves" to the "have-nots" especially in exchange for votes thereby leaving the middle class needier & more & more dejected rather than showing your true feelings re lapel pins. 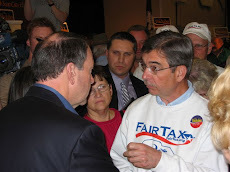 For more on the hand over the heart mistake see photo below of a campaign event in Iowa in October, 2007 & click here to see a video that shows much more than the photograph. Enemies of America are easily identified when they burn the American flag. The late Christopher Hitchens had a more subtle patriotism test – mailing an envelope with a stamp that includes the outline of the American flag placed on the envelope upside down marked you as a enemy of America to Hitch. 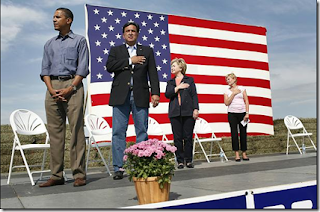 Of course BO learned to place his hand over his heart & wear the lapel pin which is much more in line with his Alinsky Method training of looking the part of being on the side of the people he is trying to betray & deceive. So now when BO decided not to attend the funeral of Supreme Court Associate Justice Antonin Scalia many people, including me, thought that he was returning to the early petty stuff that had initially marked his hatred for America. Come to find out many Presidents & VPs have not attended funerals of justices of the Supreme Court. But after all of BO's more substantive atrocities against America described on RTE the past seven years it seemed reasonable to think a spite, that BO could not resist, to Scalia & all his service was in play. BO supposedly spent the time of the funeral looking @ records & job histories for Scalia's replacement which brings up the next point of tension between BO & the Senate – whether or not BO has the "right" to nominate a replacement justice with only eleven months left in his term & eight months before the November presidential election. Republicans say no – that the new President should be the one to select the replacement justice so the American people will have a direct voice in the selection, as if they don't now through BO's election - & of course BO cites his duty under the Constitution to make the nomination himself. It is always so pathetic when BO, Pelosi, or Ringside Reid quote the Constitution to back up their position. Republicans like Ted Cruz also point out that it has been eighty years since a President made a Supreme Court nomination in an election year which may be true but is irrelevant. Forty-nine Supreme Court justices have died while on the bench & sixteen Presidents have submitted nominees during election years. Source McGinty, The Numbers, February 20, 2016. Democrats feel that BO should nominate the next justice but when the shoe was on the other foot (i.e., the parties' positions were reversed) Democrat Senators Schumer, Reid, & Biden (now VP) all independently stated that the Senate should not act on a nominee in an election year, with a sitting Republican President, thereby showing how much the Court has been politicized. It is times like this that makes every politician turn to the Constitution – especially if they feel the Constitution will support their position. Accordingly, the New York Sun studied this matter & found that the President, except insofar as the President is also a citizen, does not have any "rights" under the Constitution @ all. The Sun found that not once in the 15 times that the word "right" was used in the Constitution did it apply to the presidency. The President has constitutional duties which in this case reads "he shall nominate, & by & with the Advice & Consent of the Senate, shall appoint . . . Judges of the supreme Court" – Appointments Claus, Article II, Section 2, Claus 2. BO senses his usual position of power over Republicans, many of whom are fearing more & more every day they will wind up looking unreasonable by rejecting virtually sight unseen any & every nominee BO puts forth – especially if this process keeps up for almost a year. But nevertheless the Republican leadership (Mitch McConnell – KY) has decided not to hold Judiciary Committee confirmation hearings for any of BO's nominees even going so far as to say they would not even meet with a nominee for what has become a routine round of courtesy calls. This position is much more pleasing to the conservative base who would like to see some fight instead of rolling over. Accordingly, the court nomination will not only be a big determinant in the presidential election but also in the 2016 Senate races where 24 Republican seats expire versus 10 Democrat seats. In particular the following Republican senators face tough challenges – Rob Portman (OH), Pat Toomey (PA), Ron Johnson (WI), Kelly Ayotte (NH), Mark Kirk (IL), John McCain (AZ). Republicans currently are in the majority 54 to 46 meaning that if Republicans get clumsy a Democrat President with a Democrat Senate is very possible in January 2017 just based on the numbers in play. Earlier this week one of the longest subscribers to RTE sent me the following comment/question - "Not sure, the Senate must not shut down for any vacation until the next president takes office or the worst Supreme Court justice will be appointed?" Of course our subscriber is referring to a recess appointment – "The President shall have the Power to fill up all Vacancies that may happen during the Recess of the Senate, by granting Commissions which shall expire @ the End of their next Session" - Recess Appointments Claus, Article II, Section 2, Claus 3. Many readers will remember that John Bolton was a recess appointment of GW Bush - U.S. ambassador to the UN from August 2005 until December 2006. Bolton resigned in December 2006 (the end of the next Senate session) because he was unlikely to be confirmed. It is the Bolton recess appointment that produced many hard feelings & makes recess appointments in general so contentious today. If the Scalia replacement matter is not resolved amicably by January 3, 2017 the chance of a dirty trick increases. There will be no Senate in session for the very brief period of time that the current session ends & before senators take the oath of office for the next session of Congress. This could be strategically played out in BO's favor – who leaves office 17 days later – to make such a recess appointment. Now if a Dem wins the presidency & Dems win a majority of the Senate BO may not do this because this recess appointment, if it is allowed, would only last until January 3, 2018. BO holds the trump card either way – no pun intended. But there is more than political gamesmanship involved in all this – there is a legal aspect of leaving a four to four Supreme Court in place. Namely all lower court decisions will stand in deadlocked Supreme Court decisions – meaning Republicans will win some decisions & Democrats will win some based on the existing rulings of the lower courts. The biggest problem with all of this is not that the lower court's ruling will stand but that the same law will mean different things in different parts of the country if one lower court ruled one way & another lower court in a different part of the country ruled another way – this is one of the reasons the Supreme Court takes up cases: when lower courts, each with jurisdictions over different parts of the country, reach different decisions. For instance, there is an abortion case that comes before the Supreme Court in March that involves admitting-privilege requirements for abortion clinics. A lower court in the south upheld the law in question while a Midwest lower court struck down a similar law meaning a 4 to 4 deadlocked Supreme Court means these two sections of the country will operate under different legal standards for the foreseeable future. Antonin Scalia once shuddered @ the thought of BO replacing him but Scalia advocated originalism in constitutional interpretation & the constitutional process is that the President nominates & the Senate confirms or denies each Supreme Court nominee. What is wrong with that process that the Republicans can't live with? They should stop making noise & we should ignore the noise regarding rights, precedents, & election year nominating traditions. In fact, any denial should include a clear explanation why the nominee was denied – if done eloquently the explanation could persuade voters that the nominee would indeed be harmful to the country thereby helping turn the election away from Democrats. This seems a far superior approach than the confrontational approaches Republicans keep making – confrontations BO has always won in the court of public opinion. BTW – Republicans should be careful what they ask for regarding their making Supreme Court appointments. Five of the seven justices who voted for their own views on abortion in the 1973 Roe v. Wade case were appointed by Republican presidents. Anthony Kennedy, appointed by President Reagan, was the deciding vote making homosexual marriage the law of the land according to the Supreme Court, & John Roberts who was appointed Chief Justice by GW Bush was the deciding vote in two awful ObamaCare cases. "China is ripping us off like nobody has ever seen. Vietnam's a new one, Mexico's a disaster. Mexico's the new China. They are taking so many businesses." - Presidential candidate Donald Trump speaking to a large crowd in suburban Charleston, SC on Monday. "The challenge we face & everyone is facing is a skilled labor shortage. It's probably getting worse every year." - Doug Macpherson, General Manager @ the Baltimore office of Construction Labor Contractors a staffing agency. Last week two subsidiaries of United Technology announced they were shutting down operations in Indiana & moving 2,100 jobs to Monterrey Mexico. Engineering, marketing, & some administration jobs will remain in Indiana. Carrier – subsidiary #1, a manufacturer of heating, ventilating, air conditioning, & refrigeration systems (the company founder, Willis Carrier, invented the modern air conditioner), eliminated 1,400 jobs & will complete the move over three years starting in 2017. United Technologies Electronic Controls (UTEC) – subsidiary #2, a designer & manufacturer of microprocessor-based controls, thermostats, & zoning systems for heating, ventilation, air conditioning & refrigeration systems eliminated 700 jobs & will complete the move over two years starting in 2017. Click here to hear management's announcement to the work force @ Carrier. The relocations are being made following the continued migration to Mexico of the companies' suppliers & competitors. The minimum wage in Monterrey is 70.10 Mexican pesos per day (less than $4.00 per day @ current exchange rates) placing it below most of its peers in Latin America & last among the 34-country Organization for Economic Cooperation & Development (OECD). The total compensation for union workers in Indianapolis is comprised of an average wage $23 per hour plus employer contributed fringe benefits of health & welfare benefits, supplemental dental & vision benefits, disability benefits, death benefits, pensions, & annuities. Indiana Governor Mike Pence, upon learning about the relocations, said in a written statement that "federal regulations continue to stymie our national economy" & Washington (meaning BO's deliberate plan) is @ least partially to blame for the moves. In summary the Carrier & UTEC moves are just the latest example of BO's purposeful plan to make Americans miserable & dependent on government for their existence. I researched the above after hearing about it from Tucker Carlson – an excellent reporter. But in this case Carlson emphasized the "downside of globalization" saying that low prices of imports are the tradeoff we make in losing jobs to cheap-labor countries as if this is a fait accompli. By this logic we are all just counting down to the end of the prosperity of our society as more & more companies relocate jobs & their operations to cheap-labor countries or engage in tax inversions to the point where Americans aren't producing any wealth @ all & ultimately can't afford to buy a stick of chewing gum. Carlson should have "checked his premise" based on the best book he ever read in that he discounted the power of America's free enterprise system unshackled from BO's purposeful onslaughts designed to produce the very result Carlson was describing – how undiscerning on the part of a usual clear thinker to promote the very mindset we should all be working against. Now it is true that the 2,100 people described above who are losing their jobs in Indiana are caught in what Professor Peter Coclanis calls the "middle-income trap" - meaning a situation where economies stagnate after reaching a certain middle level, usually because their manufacturing & labor costs no longer allow them to compete with lower-cost producers, but their work forces aren't skilled enough to compete higher-up the value chain. To paraphrase – "I'm pretty expensive & not very skilled." The emphasis that I make is that even Americans skilled to make air conditioners & controls find themselves not being able to compete with Mexicans who make pennies on the dollar compared to them while making the same products. This is part of the global economy. But what is missing is the other part of the global economy or more specifically the free enterprise economy that America was founded upon & followed until the 1930s when FDR began the socialization of America that BO, Hillary, & Sanders are poised & ready to complete. To see how value producing jobs are created think of the world economy as a ladder with the U.S. currently on the top rung & developing nations with low tech labor intensive jobs like Bangladesh or Mexico on the bottom rungs. The other countries are in between. All countries try to climb to the next rung. This works well if the topmost countries create new industries & products, thus adding another rung to the ladder like when we replaced horse drawn carriages that used buggy whips with cars. Older industries can move overseas while new jobs are generated @ home. It is when innovation stalls @ the highest rung that the portion of Americans near the bottom of the income distribution must compete with workers in developing countries. This is what we are facing today as far too many Americans are so poorly educated that they have skills so limited that no employer can use them which is exactly the plan BO is implementing in making people ever more dependent on government. Source of the ladder metaphor – Professor Robert Carbaugh of Central Washington University. In summary, Americans should not be doing jobs that are classified as "third world jobs". 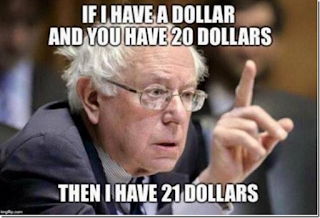 But America no longer has a free enterprise economy that will produce ever higher rungs on the ladder – we have a mixed economy that is somewhere between a totally free market economy (pure capitalism) & a government directed economy (socialism). 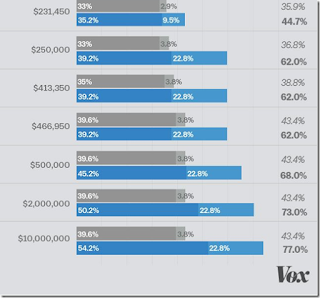 The current mindset in America is favoring more socialism because BO has intentionally produced a business climate that few entrepreneurs want to enter. The first step in correcting this problem – if people are smart enough to want to - is for everyone suffering in this middle-income trap to admit their skills are limited to the point that fewer & fewer employers have need for them. Accordingly they need better education & training – this will take looking yourself in the mirror & admitting the predicament you are in without casting blame on someone else. You have to confess (to yourself) that you have not adapted to the fact that your old job can now be done by someone in a third world country who makes pennies a day or by a machine in a sophisticated computer controlled factory. This is exactly the condition that Carrier & UTEC employees find themselves in. Since you always have to make a living – there is no such thing as retirement from receiving bills – you will have to learn new skills & retrain. Part of the cost of freedom is that everyone has to bear the cost of investment in themselves - both time & money – so they can make a living to support themselves. For example, a toll collector could have seen his problems coming if he just looked @ the number of E-ZPass lanes (or other similar electronic toll collection system) & admitted his toll-collecting job prospects were not bright. Carrier & UTEC employees could have connected some dots when they saw their competitors & suppliers moving to Mexico as mentioned above. The government has brainwashed far too many people to think they don't have to take care of themselves. In 2011 I posted the stats that some 50.5 million Americans were on Medicaid, 46.5 million are on Medicare, 52 million on Social Security, 5 million on SSI, 7.5 million on unemployment insurance, & 44.6 million on food stamps & other nutrition programs. Some 24 million get the earned-income tax credit, a cash supplement. 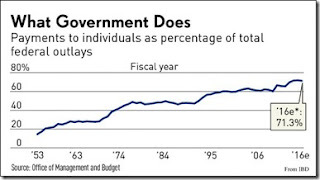 In 2010 such payments to individuals were 66% of the federal budget, up from 28% in 1966 – see graph below that shows 71.3% of the total federal budget is dedicated to payments to individuals. This is a lot of momentum toward government dependence & it has only gotten worse since these statistics were compiled & ObamaCare will further swell the Medicaid, unemployment (& SSI by extension), & EITC numbers. This post presents the way forward to break the government dependence spell that has been cast on America the past 80 years. The solution is grounded in limited government, personal responsibility, & the free enterprise capitalistic system – the only cure for socialism that I know of. The next step is for liberty loving leaders (or leader) to explain how capitalism is the only alternative to turn the socialist mindset & middle-income trap around by countering the destructive path far too many of our citizens are experiencing – our society either lurches further toward socialism & destructed lives & livelihoods or returns to the excellence of high achievement that is earned through capitalism by freeing entrepreneurs from BO's burdensome government regulations that have hamstrung our economy. This revitalized start begins with everyone facing the fact that something different happened in November 2008 & it was confirmed in 2012 – & that something is evil & a deliberate deception to overrun our country. What happened to the people @ Carrier & UTEC is an example showing how this deception leads to people becoming dependent on the government. The last seven years has not been about the usual sort of things the two parties argue over & take turns winning elections over. These years have been about robbing liberty from people by increasing dependency on government & promoting destructive class warfare & envy & there is no end in sight to this nightmare & no foreseeable practical solution other than for those of us who still unabashedly believe in America to teach & live the libertarian principles that our country was founded upon. Start with the thought of freedom & explain that all prosperity comes from unleashing the free human intellect. If we lose with that message all is lost anyway @ least until John Galt comes forth. Click on the reference post below for specific solutions to problems regarding Medicare, Social Security, federal spending, & the FairTax. The fact that Democrat Socialist Bernie Sanders has a large following is one thing – the fact that so many of those followers have no idea what Bernie's socialist policies mean is another. Sanders beat Hillary last night in New Hampshire 60.8% to 38% (15 delegates to 9) after effectively tying the front runner last week in Iowa where he won the votes of caucus goers under age 30 by a margin of 84% to 14%. 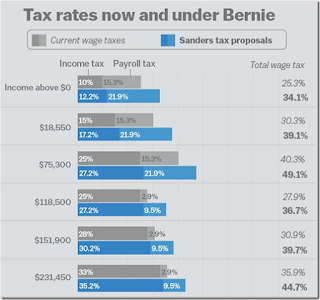 Sanders strong performance in the first two electoral contests is grounded in the under 30 voters not knowing what socialism is – they have no direct experience with socialism & in getting a poor education in government schools they never learned about its miseries. Couple this with BO purposely wrecking much of America's free enterprise system during their lifetimes & it is not hard to understand that millenials do not know capitalism's benefits including its relationship with liberty. Accordingly, the emergence of socialist Sanders promising free college for all, universal single payer healthcare, a mandated minimum living wage, & expanded family & medical leave being attractive to these uninformed people is not far fetched. 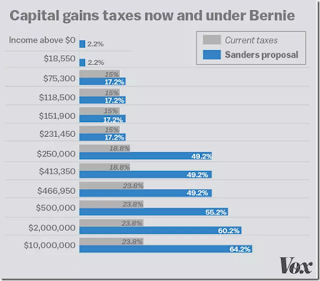 "We're more than 50% socialist. And I don't think we're getting our money's worth." In Europe, 20% of the working age population depend on various government benefits as their sole or main income. 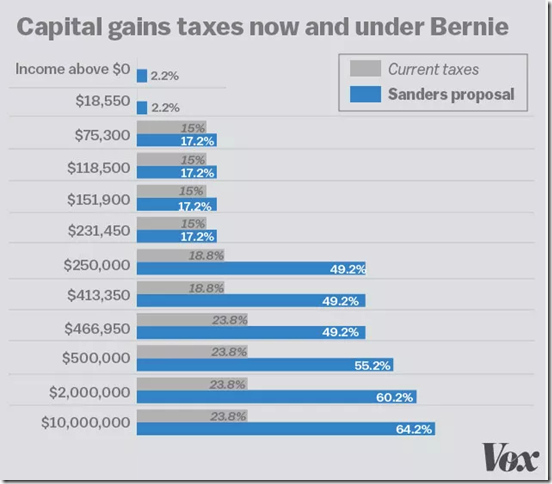 In America this figure is 13% for sole or main income but rises to 70% of American households who already depend on the federal government for a benefit of some sort so Sanders is right in vogue with the current mindset of most Americans. Click here to see some of the latest examples showing Sanders's supporters having absolutely no idea what they're doing - including not knowing that part of Bernie's MoveOn.org's financial support comes from billionaire George Soros. These people may not be stupid but they sure haven't figured out that they have not yet accomplished anything in life. They have no inclination to create wealth or improve society. In short Sanders supporters are lost souls. Thanks to the Tax Foundation for working with the Sanders' campaign to provide the following analysis regarding Sanders' tax plan that is required to produce the revenue to fund Bernie's socialist policies. As you study the tax rates below please realize that Scott Hodge, President of the Tax Foundation, calculated that in order to bring every family in America to average requires the people in the top two quintiles to pay higher taxes than they currently do with people in the top quintile paying the vast majority of an additional $2.4 trillion per year in federal taxes or 74% of their income. 2. Creates a new 6.2 percent employer-side payroll tax (i.e., health care premium paid by employers) on all wages and salaries. 3. 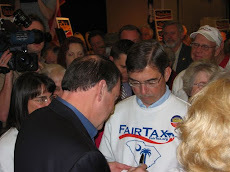 Creates a 0.2 percent employer-side payroll tax and 0.2 percent employee-side payroll tax, to fund a new family and medical leave trust fund. 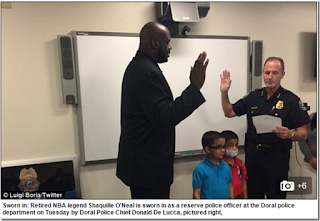 Last month Officer Bobby White of the Gainesville, Florida police department responded to a noise complaint – only to find it was a group of neighborhood kids doing what they do best – play basketball. Officer White joined in, shot a few hoops, & organized a pickup game for the next day saying he would return with backups for his team. The video of Officer White shooting hoops went viral to the point that Shaquille O'Neal saw it & asked to join the pickup game saying he wanted to meet Officer White & help. Click here to enjoy the highlights of the fun of the pickup game but please listen closely to Shaq's words @ the end of the video – it is the reason he rolled into this neighborhood to play ball.